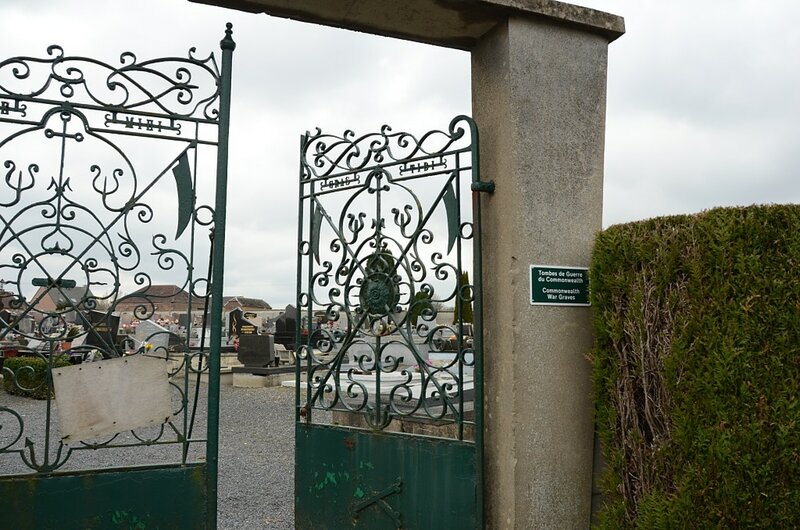 La Longueville Communal Cemetery contains six Commonwealth burials of the First World War. All the graves are located in the North-East corner except for Private Wardrope who is on the East side of the cemetery. 15319 Lance Corporal Harry Brown, M. M. 1st Bn. Coldstream Guards, died 8th November 1918, aged 23. 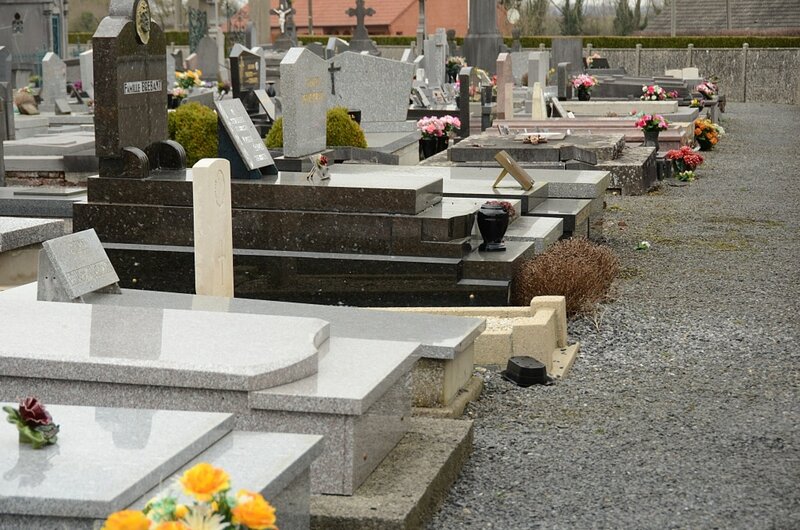 Son of Henry and Margaret A. Brown, of 8, Wellgate Mount, Rotherham. 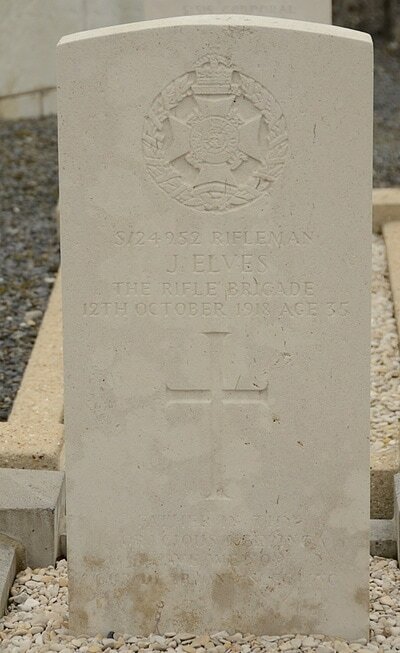 S/24952 Rifleman J. Elves "C" Company, 16th Bn. 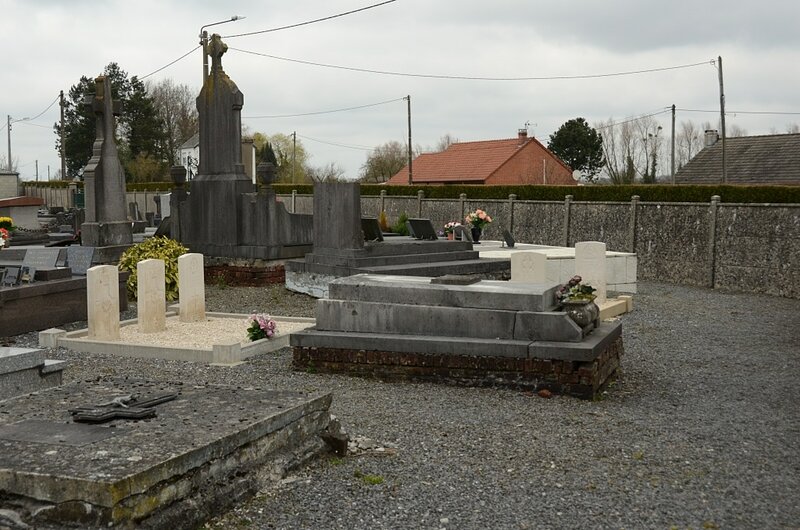 Rifle Brigade, died 12th October 1918, aged 35. Son of Mrs. Emily Elves, of 55, Three Colts Lane, Bethnal Green, London. 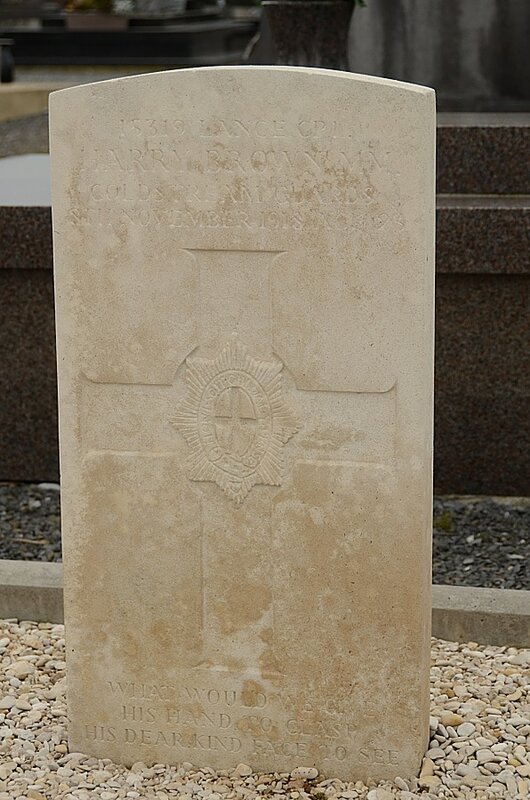 63596 Private George Henry Galpin, 1st Bn. Canterbury Regiment, N. Z. E. F., died 5th November 1918, aged 30. Born at Guernsey, Channel Islands. 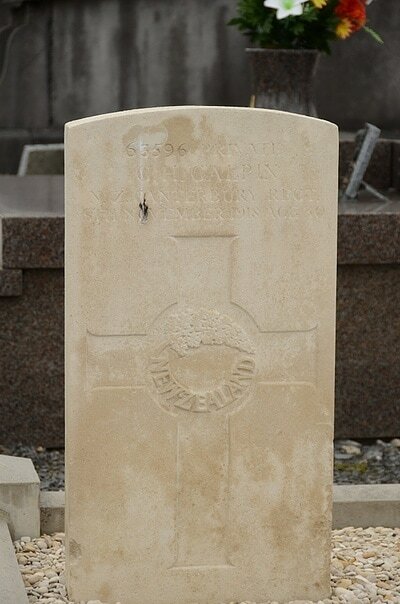 Son of James and Carrie Galpin; husband of Elspeth G. Galpin, of 16, Blythe St., Berhampore, Wellington, New Zealand. 9542 Private Alfred William Johnson, M. M. 1st Bn. 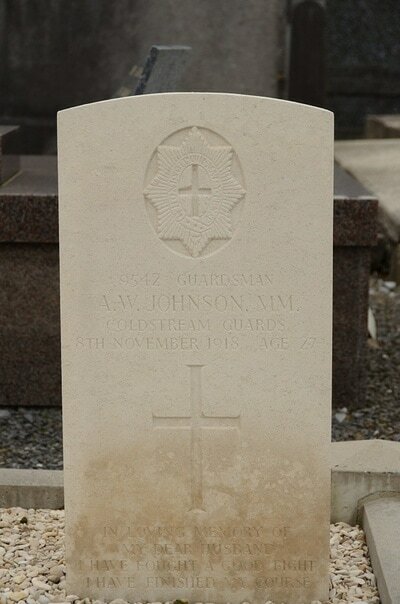 Coldstream Guards, died 8th November 1918, aged 27. Son of Frederick and Ada Johnson; husband of Mrs. A. W. Johnson, of 5, Harriett's Terrace, Eastbourne St., Hessle Rd., Hull. 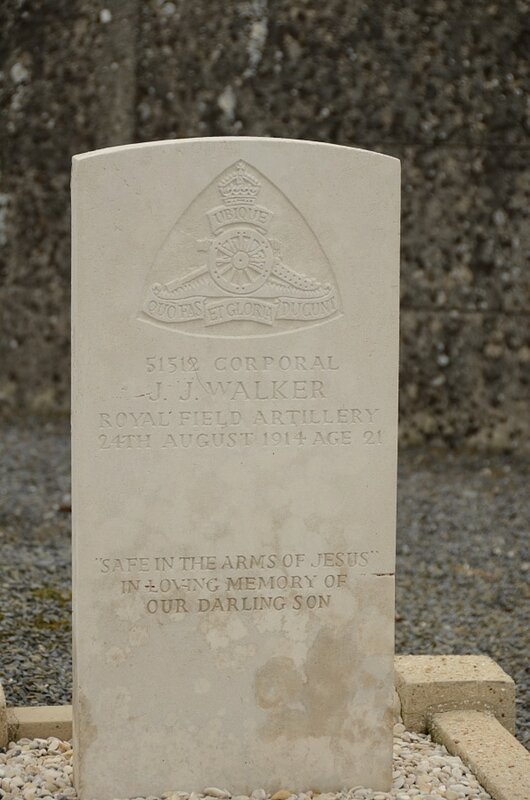 51512 Corporal J. J. Walker, 70th Battery, 34th Brigade, Royal Field Artillery, died 24th August 1914, aged 21. 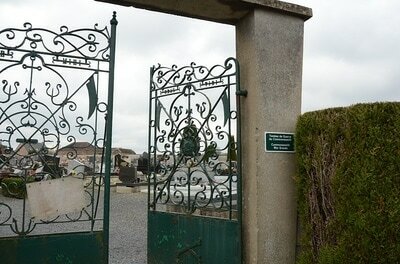 Son of John I. and Elizabeth Walker, of Kildare Cottage, Bath St., Wicklow, Ireland. 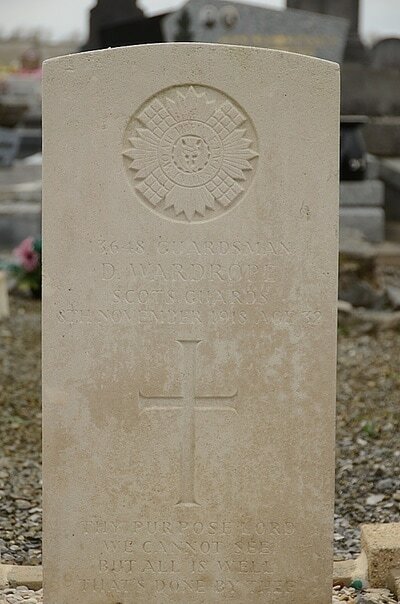 13648 Private D. Wardrope, 1st Bn. Scots Guards, died 8th November 1918, aged 32. Son of Thomas and Mary Wardrope, of Bathgate; husband of Maggie Wardrope, of 1, School Lane, Cockenzie, Prestonpans, Edinburgh.